My book today is Bitter Lemons of Cyprus by Lawrence Durrell, one of the books I’m currently reading. Page 56: Durrell is buying a house in the Greek village of Bellapaix and the owners have gathered their family in the village cafe to agree upon the price. They sat on a semicircle of chairs, sipping coffee and arguing in low voices; a number of beards waggled, a number of heads nodded. They looked like a rugger scrum in an American film receiving last-minute instructions from their captain. Soon they would fall upon us like a ton of bricks and gouge us. I began to feel rather alarmed. I’ve visited Cyprus several times, but not the area Durrell wrote about in this book – Kyrenia in Northern Cyprus. His description of it and Bellapaix makes me wish I could have seen it then in the 1950s. 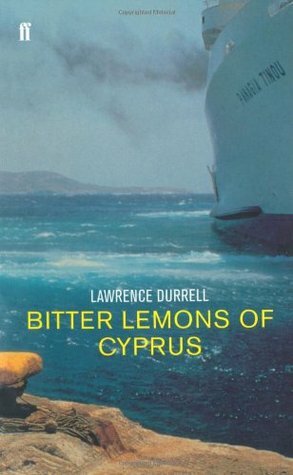 Bitter Lemons of Cyprus is Lawrence Durrell’s unique account of his time in Cyprus, during the 1950s Enosis movement for freedom of the island from British colonial rule. Winner of the Duff Cooper Memorial Prize, it is a document at once personal, poetic and subtly political – a masterly combination of travelogue, memoir and treatise. This sounds like an evocative description of the place, Margaret! I like the setting very much. I’ll be interested to see what you think when you’ve finished. Durrell’s writing is richly descriptive, Margot. No doubt that I’ll be including more extracts in my post after I’ve finished the book. I would continue! Have not read a Durrell book yet. Loved the Tv series The Durrell’s. I had never heard of Gerald or Lawerence until then. From the series it’s hard to take Lawrence seriously! But your post makes me want to read something he wrote. I think I would be pleasantly surprised! Peggy’s that’s interesting – I didn’t watch the TV series, but from what you say Lawrence doesn’t come across as a serious person, but in this book I don’t get that impression. I read My Family and Other Animals many years ago (when I was at school) so I don’t remember much about it! I love traveling and do a lot of it through books. These days I don’t do much actual travelling, so a lot of mine is through books too. Sounds interesting but not the sort of book I usually choose. This week I am spotlighting a middle grade fantasy – The Storm Keeper’s Island by Catherine Doyle – from my review stack. Happy reading! I like the quotes. Bitter Lemons of Cyprus sounds pretty interesting. Enjoy your current read! I would keep going. I’ve had Bitter Lemons hanging about the house for years but haven’t got around to it yet. Do read it! I’ve read nearly half the book up to now and have just started to read about Enosis – the case of the Greek-Cypriots for union of Cyprus into Greece – something I know very little about!